The Belfast Free Library invites community members to a free screening of the documentary film Finding Kind on Wednesday, April 5th at 6:00 p.m. The film will be followed by a discussion based on the filmmakers’ Kind Campaign, an anti-bullying movement for girls that has impacted millions of individuals across the globe. 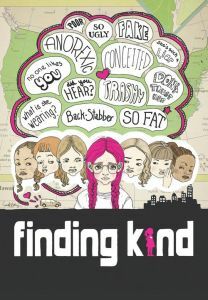 Finding Kind is a documentary that addresses bullying and “meanness” in the world of girls. Filmmakers Lauren Paul and Molly Thompson set out on a 10,000 mile long cross-country journey of discovery and education, interviewing hundreds of females across America about girl-against-girl bullying. Paul and Thompson find, among personal accounts, universal truths about the pressures of being a girl and how those pressures can take a toll on our relationships with other women. With moments that run from universally funny to shockingly raw and personal, Finding Kind asks viewers to take a stand against bullying, and for kindness. The film is recommended for educators, parents and students grade 5+. Parental discretion is advised as the film touches on difficult themes, though tempered by an overall positive message. Make a Zoetrope in the YA room!